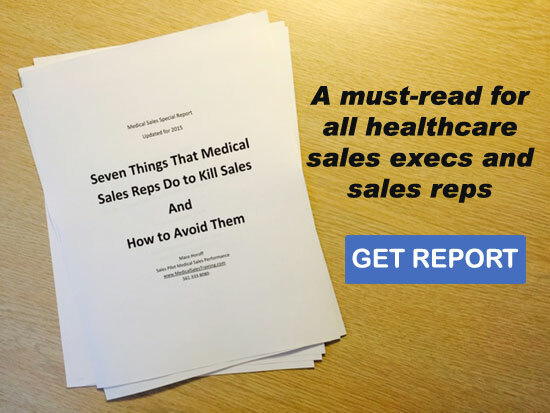 Medical sales training is often at the bottom of the list for healthcare sales representatives. After all, many people who enter into medical sales bring sales experience from other industries. Sales is sales, right? Many think that sales is intuitive, and at least in principle, easy. Just show your products, deliver features and benefits, ask for the business. Provide customer service after the sale. Not too complicated. Simple in concept. At best, a formula for something less than mediocrity. At worst, a simple plan for failure. Without comprehensive medical sales training, medical sales is easy…to fail at! Over the last 30+ years I have witnessed countless examples of clinical personnel who obtained a medical sales position, only to return to a clinical position about a year or two later. Why? Because they couldn’t cut it. These are people who had extensive clinical knowledge. One would think (just as the people I’m referring to did) that a high-degree of clinical expertise would provide a competitive advantage. Actually it often provides a level of false competency and even complacency. Is clinical knowledge important? Yes, but only to a degree. And it’s also only one knowledge area necessary to succeed, and I will argue that it’s not the most important one. Common sense, right? You better know how to manipulate the controls, perform take-offs and landings, work the radios and all that cool stuff. So, the answer is right. You need to know how to fly a plane. But it’s only partially correct. There is so much more to learn. A pilot has to acquire competent knowledge and skills in meteorology, navigation, federal air regulations, flight planning, communications, instrument flying, aircraft systems, emergency procedures, regulatory compliance, and more. Deficiencies in any of these areas won’t only disqualify you from flying, they might also get you killed! Why does aviation demand such a high level of competency? Because there is so much on the line. You must do all that you can to minimize risk and assure a successful outcome. Pilots undergo a comprehensive curriculum of initial flight training to ensure competency. But that’s not enough. Because pilots are human, their skills erode. They develop bad habits. That’s why pilots are required to re-certify or undergo recurrent training at defined intervals. I could draw parallels for clinicians in the healthcare world, but instead, let’s focus on medical sales and what proper medical sales training provides. Are there only three competencies to succeed at medical sales? No, there are many more. But here are the big three. These are the three broad categories that one must truly be competent in to have any hope of long term success. Achieve a level of competency in all three and sales reps become what I call The Triple Threat. I can tell you that there are surprisingly few triple threats. Relationship skills. Okay, everyone knows relationships are important. Again, this seems pretty intuitive, right? Most reps I talk to describe relationships as getting along with customers, being liked, knowing and trusting each other. Again, intuitive and correct. But so much is left out. How do you establish and sustain relationships with the stakeholders you sell to in healthcare? It’s not about bringing lunch to a doctor’s office, treating a customer to a round of golf, or taking a customer out for cocktails or dinner. In fact, with industry-wide compliance issues, it had better not be solely about those things! So, what is the basis of highly functioning relationships in medical sales? Simple. It’s about the medical sales rep’s ability to be considered as a key player in helping clinicians and healthcare institutions to deliver health care while meeting their mandates and goals. In other words, you’ll have better relationships to facilitate sales with customers whose problems you solve than customers you make unhealthy with free food. Feed me and I like you. Make my professional life easier, better, and more rewarding and I freakin’ love you! And when I get to know you over time, trust you and depend on you, that relationship is rock solid, at least from a business perspective, and that’s what really matters. In medical sales, even something as seemingly basic as relationships isn’t purely intuitive. It requires a thorough understanding of the customer’s world and how to improve their condition. Simple in concept, but definitely not easy. Great medical sales training provide the skills and knowledge to build relationships with key stakeholders. Unfortunately, few companies provide this skills set in their training programs. Expertise is optional, but competency is mandatory. You must be knowledgable about your products. You must be able to help customers use your products for the conditions and situations for which they were designed and approved. Know how to troubleshoot and solve problems with products. A good working knowledge of the specialty or specialties you sell to is also required. Why do I refer to “medical” selling skills as opposed to just “selling skills?” Is there a difference? Selling to healthcare is different than selling in any other industry. There are parallels and similarities, sure. Many of the principles are the same. What differs is how buyers thinks. When selling to healthcare clinicians, for example, you’re selling to some of the most highly-educated, highly-trained, and confident people in the workforce. Very specific skills are required just to get their attention, let alone influence their thinking. You’re also selling to people who assume responsibility for people’s lives. When treating patients, HCPs strive to limit trial-and-error. Your prospects and customers seek to avoid the risk that comes with trying new products. This is always working against you. Combine that with Affordable Care and increased accountability for everyone involved and the complexity of the sale process is palpable. The age-old sales approach of show up and throw up doesn’t cut it. There I said it. Because it’s true. During my medical sales training seminars, I’ll qualify how sales reps assess their skills and abilities. Most have a very high level of confidence as to their ability to sell and influence a sale. The reality is often very different—easily fixable, but different. I’ll frequently deliver a medical sales training workshop on selling skills either before, after, or concurrently with product training. Reps will test very high in product knowledge after product training. When I place them in realistic, high-pressured role-play situations, they fold. They data-dump and resort to survival instincts instead of allowing their training to take over. product knowledge into a sales process that is supported by a competent skills set. Back to the original question: Do You Need Medical Sales Training? Hopefully, the answer is obvious: Only if you want to maximize your sales and career results. Pilots train to ensure successful outcomes for every flight. Pro athletes train regularly to maximize their performance in the game. Medical sales professionals get to earn a professional-level income, but only if they can perform at a professional level. The only way this can happen in the short or long term, is with commitment and comprehensive medical sales training. Thanks Mace. I found the link to flying most appropriate and have often used the same analogy to challenge team members who believe they ‘know it all’! Just as pilots have to annual check rides and proficiency checks, so should any professional. We should earning annual CPD points (continuing professional development) to ensure we are practicing as professionals. I challenged my team this year with a question around whether they are planning on improving their personal performance or do they plan to stay or become mediocre!